I love a good Mexican fiesta. Chock-full of bright spices, crisp veggies, salty cheese and creamy avocados, a fajita feast is a fun way to have tons of different bits that are quick and easy to prepare. The problem is, with a meal like fajitas, the sodium and fat content can soar before you get all the protein and goodies you need. Things like prepared taco spice have too much sugar and salt and very little actual spice, meaning you have to use a lot more to get the flavour you desire. And, if you go for the pre-spiced veggie options like flavoured TVP (textured vegetable protein), you can have the same issues. So I decided to go all natural and keep it simple, starting with a homemade spice mix and a bag of dried TVP chunks, which can cost less than 50 cents a cup when you buy them in bulk. I set to work making this vegetarian filling – and it only took about 20 minutes. Rehydrate TVP with your favourite flavours in just a few minutes. Mix all spices together in a small bowl (including salt and pepper) and set aside. Pour 1 cup boiling water into a bowl and add the 1/2 a boullion cube, dissolving in the water. Stir half the spice mix into the water and add the TVP. Cover the TVP and let it soak for 5-10 minutes, stirring once or twice and testing to see if there are an crunchy bits left. It should be completely spongy. You may need to add a bit more hot water. 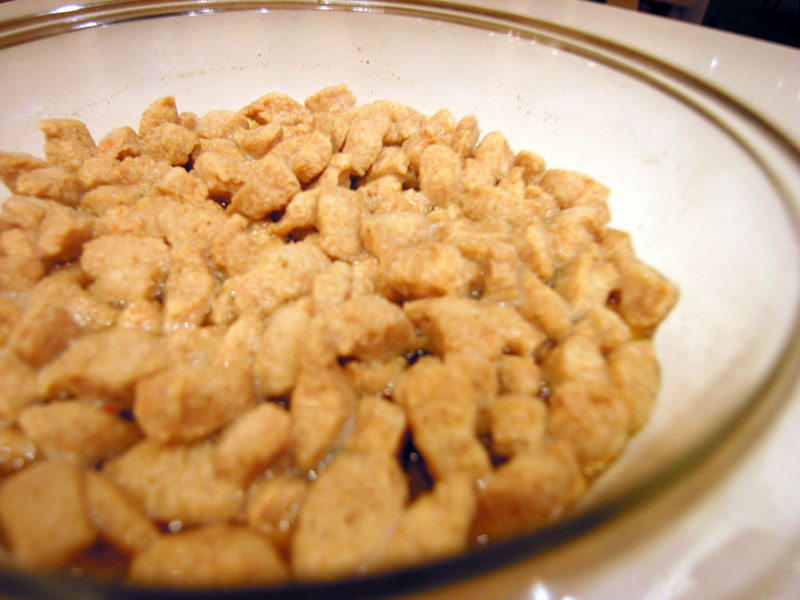 Don’t worry if there’s a little excess water in the bowl; it will cook off in the pan. Heat a large pan and add enough oil to coat the bottom. Put the eggplant cubes in the pan and make sure they are spread in a single layer. Sprinkle in a little salt and flip when one side is cooked (or just toss until you can’t see any white uncooked bits). Push the eggplant to the edges of the pan, pour a little more oil in the middle, and sauté the onions and peppers for 3-5 miutes, adding the rest of the spice mix. Pour in the TVP and any excess liquid. Toss and cook until the TVP is heated through. 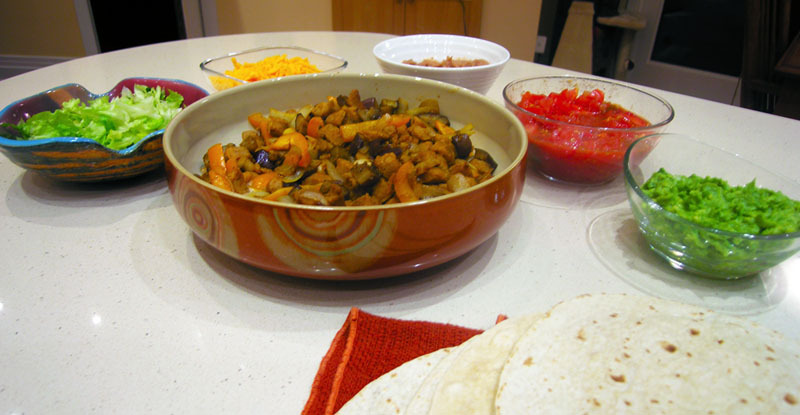 Serve in tortillas with your choice of fixings. I went pretty crazy, using guacamole, salsa, refried beans, lettuce strips and shredded cheese. This filling can go with any Mexican meal. Serve it in hard tacos, on top of nachos with some melted cheese, or over rice with a little salsa. My parents and I had a great time mixing and matching toppings for a dinner that was easy on the guilt levels and high on protein. Next time, I’m going for homemade tortillas, too.